An illuminating tour of the world economy. In more than a dozen vignettes, veteran journalist Altman describes the people, deals and issues that helped shape the international economy on a randomly chosen day, June 15, 2005. His effort to elucidate the complexities of globalization abounds with revealing stories. Haier, a high-end Chinese appliance company, designs niche products, partners with local companies in overseas markets and for two decades has boosted sales by an astonishing 68 percent per year. Changes in required labor skills present Calgary oil companies with huge challenges in recruiting workers from abroad. Multinationals play a major role in countries like Vietnam, where Intel has worked with the government to become the driving force for the entire computer industry. Altman uses each story as a window on a crucial market: stocks, credit, currencies, oil, etc. He presents information in accessible language, whether describing the strategic linkup of a telecommunications giant (Sweden’s Ericsson) and a music retailer (Napster), or the battles over trademarks and copyrights now so common in the marketplace. His examples frequently illustrate connections: Change the interest rates in one country and you affect the entire global market; raise oil prices and it becomes more difficult to move goods around and to obtain raw materials for hundreds of products. 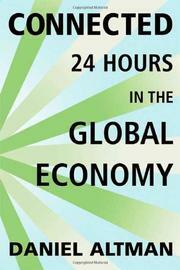 One chapter explains why the U.S. sets so many global rules and gets to appoint the president of the World Bank. (Size and wealth matter.) Altman notes that interdependency in the IT age demands international cooperation. Danger lurks in the form of sabotage, a lethal computer virus or even a simple typo. In 2005, a Tokyo broker wanted to sell one share of a stock for 610,000 yen but entered an order to sell 610,000 shares. He wiped out $224 million in potential profits. Invaluable reading for Globalization 101.